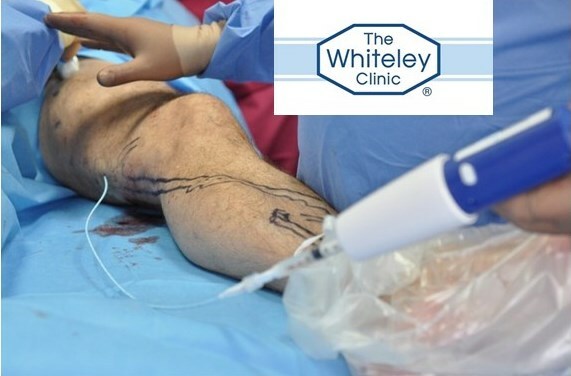 Venaseal™ or 'superglue' treatment for varicose veins is now available for private patients at The Whiteley Clinic. As a new procedure, the Venaseal™ or “superglue” treatment by Sapheon does not currently have a procedure code and is therefore not currently covered by private medical insurance. It is therefore only available to those patients who are paying for themselves and wish to undergo this procedure. In addition, not every patient is suitable for the Venaseal™ or “superglue” treatment. As such all patients will have to undergo our usual consultation and a venous duplex ultrasonography to find out exactly what is going on inside the legs and find out which veins are involved before a decision as to whether Venaseal™ or “superglue” treatment is possible in their legs. The Venaseal™ or “superglue” treatment by Sapheon is a new way of closing the main vein in the leg that causes varicose veins (usually either the great saphenous vein GSV or the small saphenous vein SSV or both). When the Venaseal™ or “superglue” treatment is performed, only one needle hole is needed per vein treated as there is no need for the additional injections of local anaesthetic around the vein – unlike endovenous laser ablation or radiofrequency ablation. However, although the early findings do look promising, the Venaseal™ or “superglue” treatment for varicose veins has not been around long enough to have shown that it keeps the vein is closed in the medium to long term. Therefore, although The Whiteley Protocol® method of treating veins with endovenous laser ablation and radiofrequency ablation shows near perfect results in closing treated veins in the long-term, we cannot be certain of the long-term results of Venaseal™ at the moment. Hopefully the current studies will show it to be as effective in time. In addition to this, although the Venaseal™ or “superglue” treatment for varicose veins reduces the number of injections significantly, if additional procedures are needed such as phlebectomies, then further injections may be needed. Finally, as the Venaseal™ or “superglue” treatment for varicose veins is so new, the cost is currently significantly higher than that of endovenous laser ablation or radiofrequency ablation. Once a duplex ultrasound scan has been performed to identify exactly how many veins and what pattern of venous reflux needs treatment, we will be very happy to quote a price for the Sapheon Venaseal™ or “superglue” treatment based on each patient’s individual needs.